The first round of ties being offered are made of Grenadine silk which have an incredible feel to them. Delivery is said to take 4-6 weeks, however mine took a little longer because I had provided incorrect measurements, which Linkson thankfully caught and let me know the measurements would be adjusted. Sadly, there was another mix-up at the manufacturer, who provided the correct color and length, but the tie came as a 5 fold instead of the 7. Your standard store-bough tie is usually 3 or 5 fold. While more high end tie makers will fold a tie 6 or 7 times to give it more elegant heft and drape. With these additional folds come additional cost because of the extra labor needed to create them. Having never had a 7 fold tie before, I was excited to try one. Because Arcuri was providing this sample at their expense and the tie was already late, they went ahead and sent me the 5 fold instead. Hardly a big deal and it was incredibly unlikely that I would be able to tell the difference anyway. Plus the fact that, hey, I’m getting a free Italian-made bespoke tie here, led me to be a little more understanding. Finally the tie arrived in the mail and I couldn’t wait to see it. 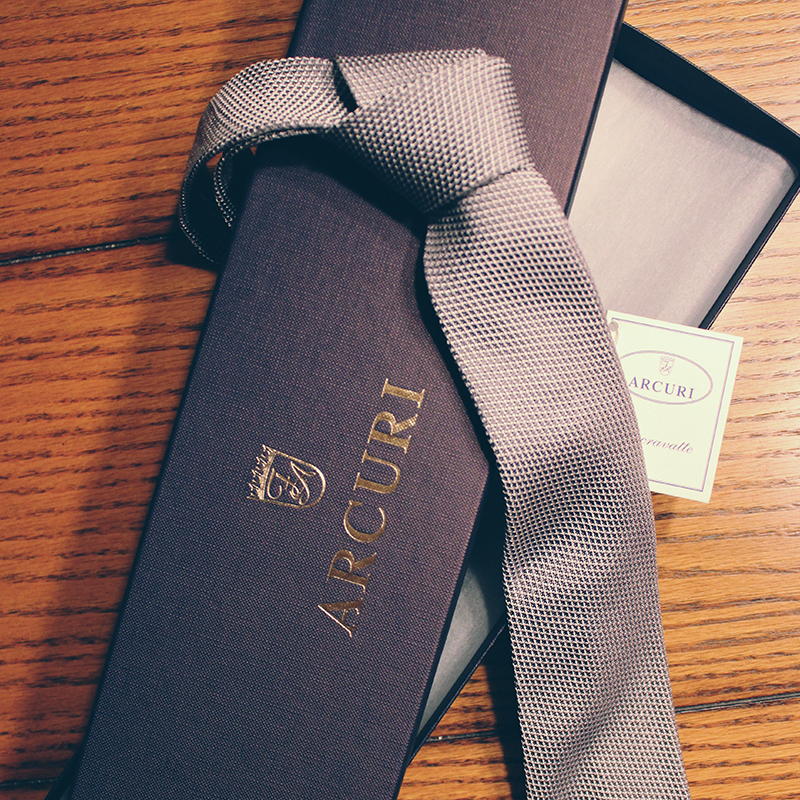 First of all, the Arcuri box it came in was beautiful. Upon opening it, the grenadine fabric has a very luxurious feel and weight to it, despite only being a 5 fold. The grey color was a bit more metallic looking than I was expecting, so I had some difficulty figuring out what to pair it with, but the color was chosen before the site was live. Now that there are actual photos of the ties online, I would have most likely chosen a different color. No matter, though. It’s still a beautiful tie. After wearing around the office I received numerous compliments and inquires of “what material is that tie made of?” which I was delighted to answer thanks to my newfound knowledge of tie making. I would like to thank Linkson Jack for providing me the opportunity to give their latest endeavor a Dandy Test Drive and definitely recommend giving their collection and service a try. The bespoke ties start at $135 and go up from there depending on the customization. If you’re thinking that’s a bit too much to spend on a tie, you may want to scroll down to the bottom of the post. As an added bonus, Linkson Jack has been gracious enough to offer an incredible discount to Buffalo Dandy readers! 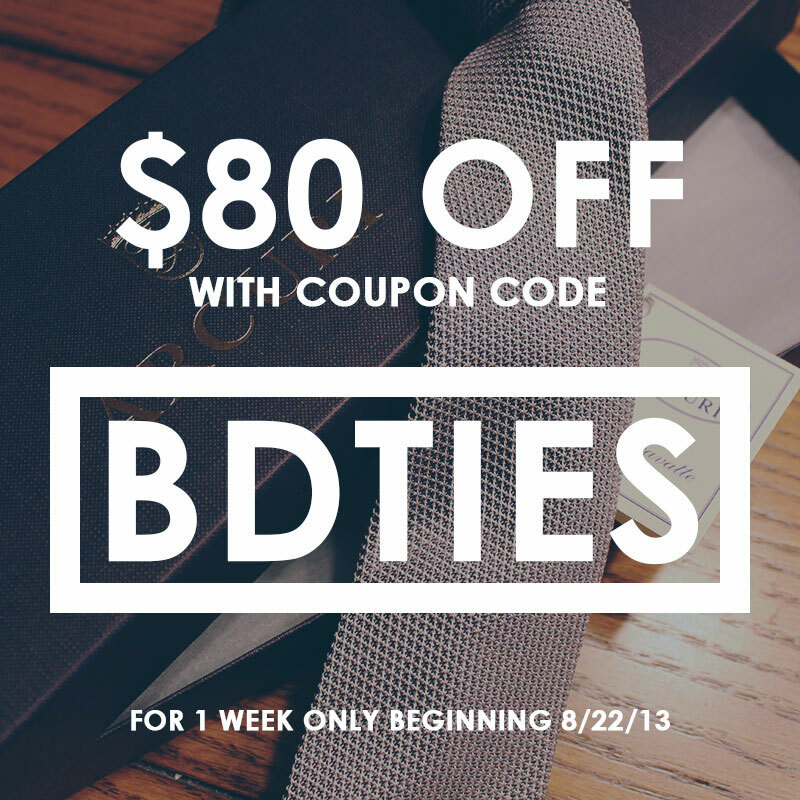 For 7 days only, beginning this Thursday (8/22) readers of Buffalo Dandy can obtain £51.50 ($80) off any bespoke tie model as well as ready to wear ties that are not on sale with coupon code BDTIES. 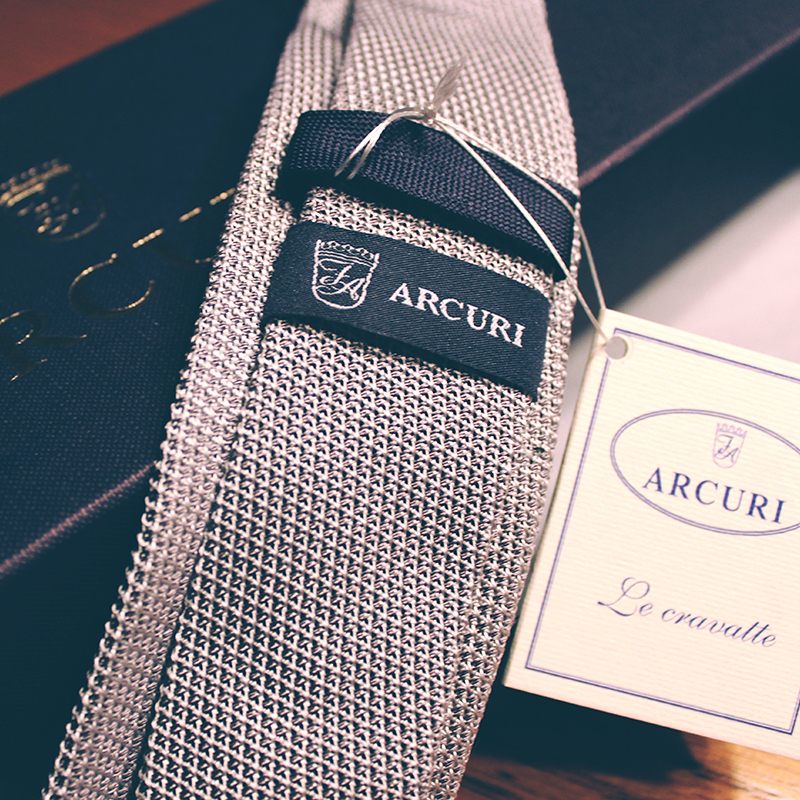 The regular start price for the bespoke ties is £100 ($156). Certain customizable options will cost more, as outlined below. Fabric: fine and large weave grenadine, linen and silk. 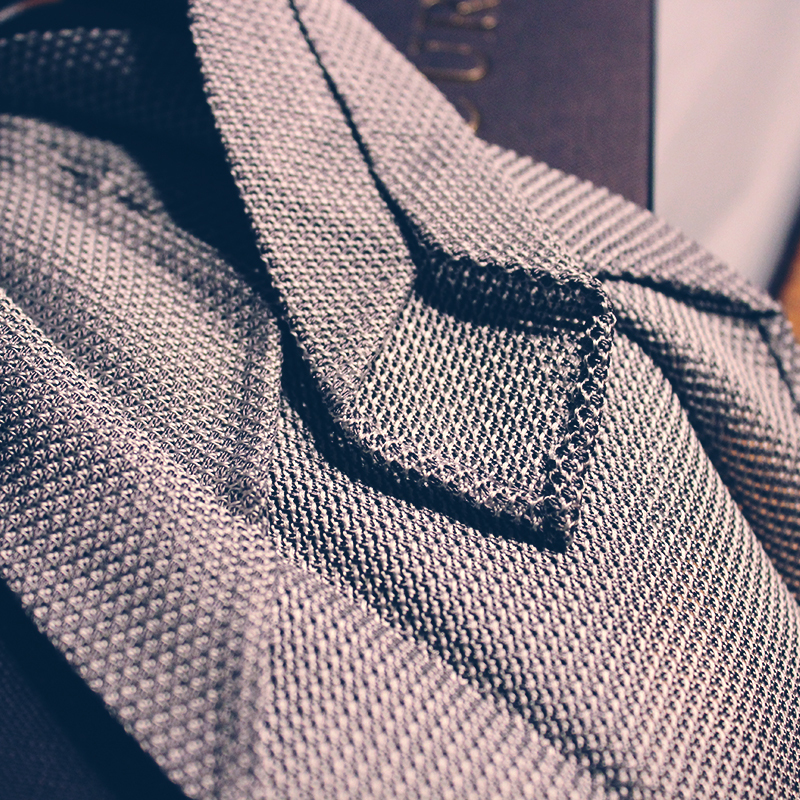 The ties are hand sewn and made to each customer’s specifications. Thus, delivery is expected to take 4 to 5 weeks. So what are you waiting for?